This is so cute! You should definitely make more, who cares that this is your 6th one...if it works for your lifestyle, sew it! Especially because it looks so good on you! You look fabulous! And, what a great shirt. I agree with Carolyn, keep the Scouts coming if you want. Whatever keeps you sewing and happy and comfy. Very neat T. I had a smile at your stripe matching - I think people who sew care about that kind of thing far more than your average shopper! I'm glad you found a pattern you enjoy. I'm the same - if I really like a pattern and it's fairly quick and fun to make, I will make several. Nothing wrong with that! If you love it make as many as you want! Especially if they are as quirky/cute this T is. I love this! The stripes and lace are a great combination, made even better by the lace looking a bit like polka dots. The lace yoke is cute! love the contrast yoke. i need a million scout tees, but sadly i've only made it once... must change that! Oooh, I love this! It's so cute on you! 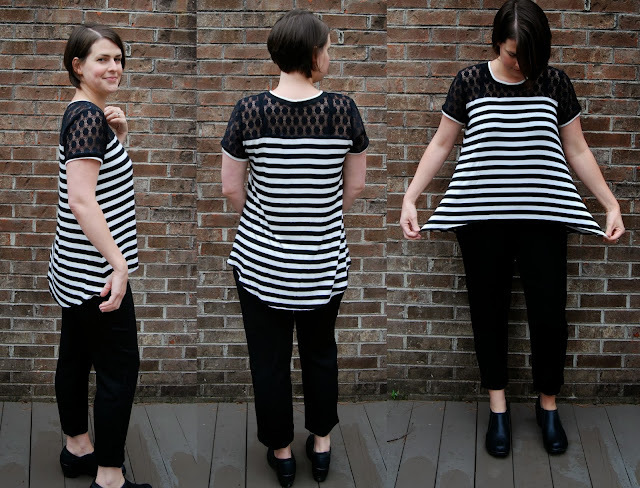 I really like it with the high-low hem-- I think I need to give that a try (the normal style looks pretty boxy on me). 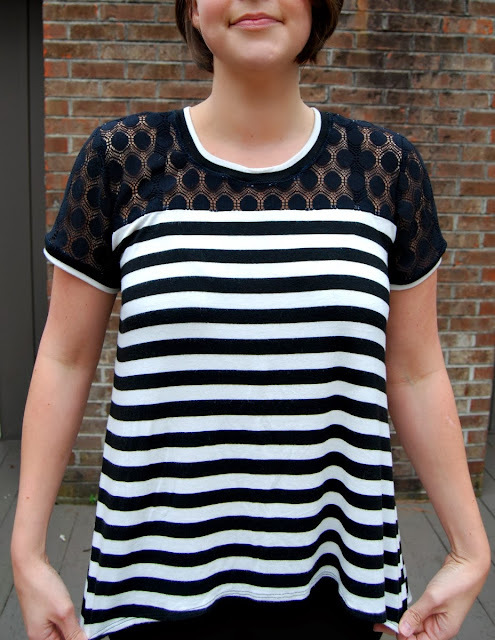 The lace yoke makes this tee look so pretty! Love it! Perfect tee!! Lovely combo of fabrics. And I'm pretty sure you can NEVER have too many of these types of tops - or just Scouts in general! It's a great pattern! I love seeing all your variations. I love this tee! The combination of lace and stripes is fantastic. You can't have too many scouts, it's too good of a pattern for that! Very pretty! I've been admiring lace-yoke tops lately (well, for about the last year, I guess). I love the lace yoke! I've wanted to try something similar on my knit peplum top pattern but I've been worried about what it will do to my shoulders. This looks great! Your shirt looks so comfortable and really cute! Did you need to stabilize the jersey where it meets the lace on the bodice? I've been working on 2 shirts using Maria Denmark's Kirsten Kimono T pattern. One is all the same fabric (poly-rayon rib knit) and the other uses the same knit and a contrast lace top. The first fits great, but the one with the seam fits weird: saggy and bigger where the fabrics meet. I really hate using clear elastic, but I don't know if stay tape would be enough. Hey, sorry for the delayed reply! I did not use anything to stabilize the jersey/lace seam. The lace I used is really not very stretchy. And then the jersey is super duper stretchy. So it seems to work without it. I did stitch some clear elastic in the shoulder seams, though. Hope that helps! Love stripes! Always love stripes! Nice to see you've squeezed in a bit of sewing time. The mother/full-time work thing is a crazy busy gig isn't it! Slowly, slowly I'm managing to squeeze a bit more in too. Ooh nice! I really like the fabric used for the upper portion, makes the whole thing a bit more formal and dressy.